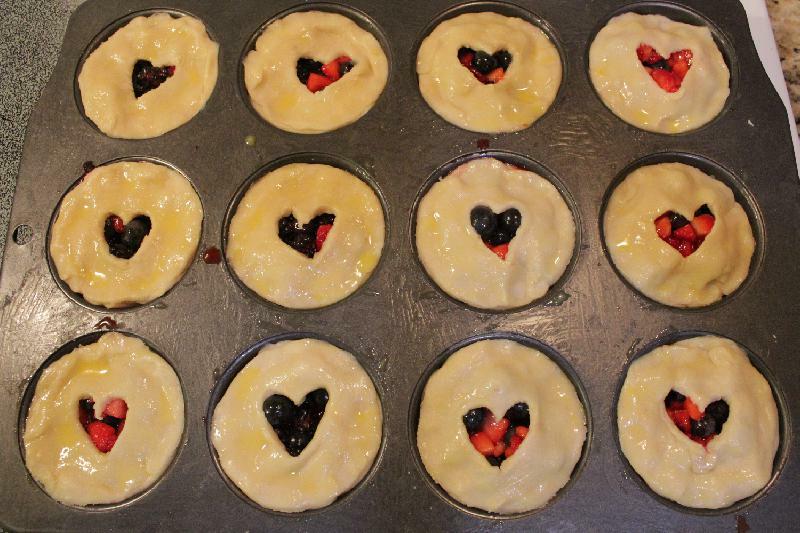 I’m bringing you Mixed Berry Mini Pies for Pi(e) Day! That nerdiest of days when we celebrate March 14, or 3.14(159…) There are over 20 bloggers participating in this delicious event–either we’re a nerdier bunch than I realized or we really, really like pie. Six of one, half a dozen of another? Some of the pies are sweet, some are savory, all are mouthwatering. Some are St. Patrick’s Day or Easter inspired! Scroll down for the full list! On another note, I got my glucose test results back…aaaand they are not good. I’ve officially been diagnosed with gestational diabetes. My next step is to make an appointment with a high-risk specialist, and somewhere in there I’ll meet with a nutritionist. I will admit: I’m really upset about this. I like my food. I like people not telling me what I can and can’t eat. I like not having to be the one to tell myself what I can and can’t eat. I realize that I’ve been doing this to an extent already by cutting out runny eggs, raw fish, and so on, but this feels like a much bigger deal. Not eating sushi isn’t that hard; completely overhauling my diet will be. (I accidentally typed “pasta” in the middle of that sentence, if that gives you any insight into my mind right now). And I think I may have to cut down on fruit, which I am NOT. PLEASED. about. How does this change my pregnancy? I’m not sure yet. Blood tests (ow), different diet (sigh), more exercise (lovely). Presumably more doctor follow-up? Somewhat counter-intuitively, my weight gain has been excellent–I’ve gained 20 pounds so far, which my doctor literally said was “perfect.” So I’m not really sure what follows. I’ll have more to report later. Only 10(ish) weeks to go! And now, from the lady with gestational diabetes: pie! Do me a favor and ignore the irony here. The best I can say here is that this is a relatively low added-sugar recipe, so it’s not as bad as it could be. 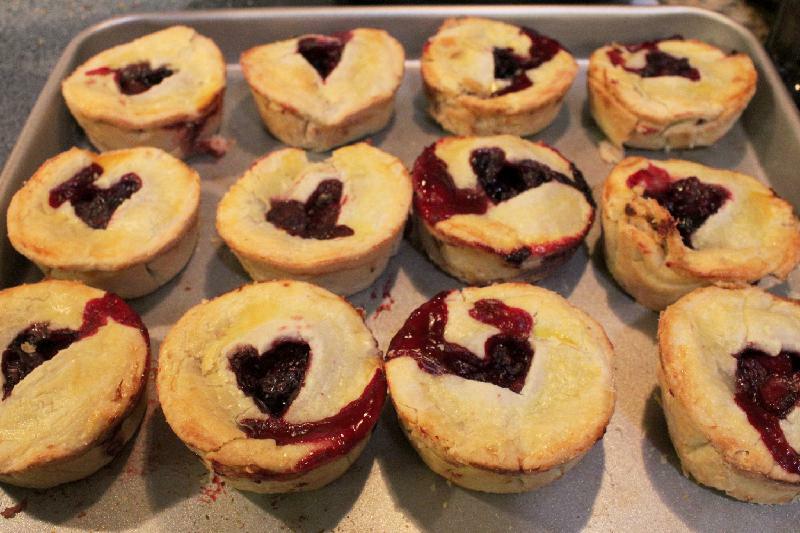 These mixed berry mini pies were a team effort between myself and my good friend Kelsey, who doesn’t blog but would have a KILLER baking blog if she so chose. I mentioned making pie for Pi Day, she said “I’ll make pie!” and I ended up in her kitchen with my laptop, camera, and several pounds of berries. We took a couple of tries for this, but I’m quite pleased with the final recipe. Like any pie, this one has a few steps, but I like to think that this is as easy a pie recipe as you can find. You prep the bottom crusts, make the filling, assemble, and bake. 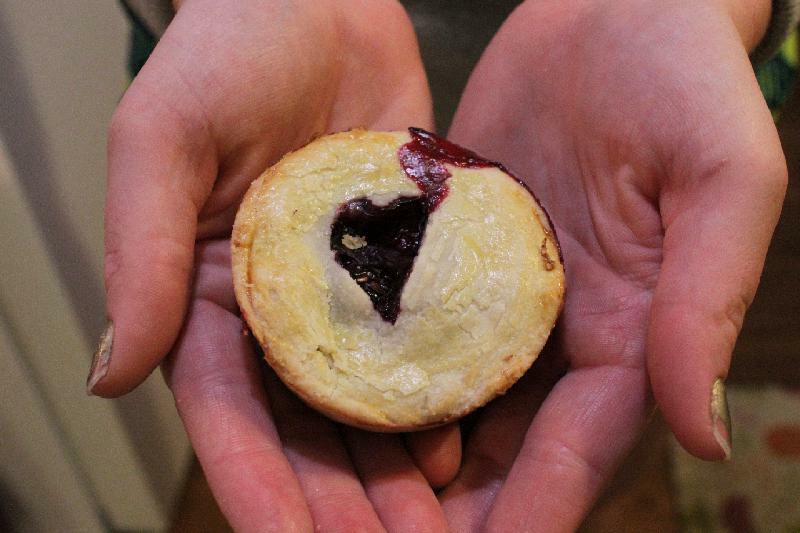 For an hour or two of work, you get twelve ADORABLE tiny pies. We referred to this article for tips on making very small pies. One thing to note is that the crust-to-pie will be weighted in favor of crust, which may be good or bad depending on your preference. I’m reasonably sure this could be made with any fruit! I do recommend cooking the fruit first, because as it cooks it shrinks, so a mini pie that starts full of uncooked fruit will end up a only a third full. If you make these, whether with berries or something else, let me know how they work! Or tag me on Instagram–I’m @BearandBugEats. Pie filling adapted from SkinnyTaste; I recommend this Perfect Easy Pie Crust recipe! Melt butter in a small bowl. Use a pastry brush to thoroughly coat the cups AND top surface of a muffin tin. Set aside. Roll pie crust out to 1/8″ thickness. Cut out 12 circles with a large biscuit cutter (or cocktail glass, takeout container lid, or anything of the right size). 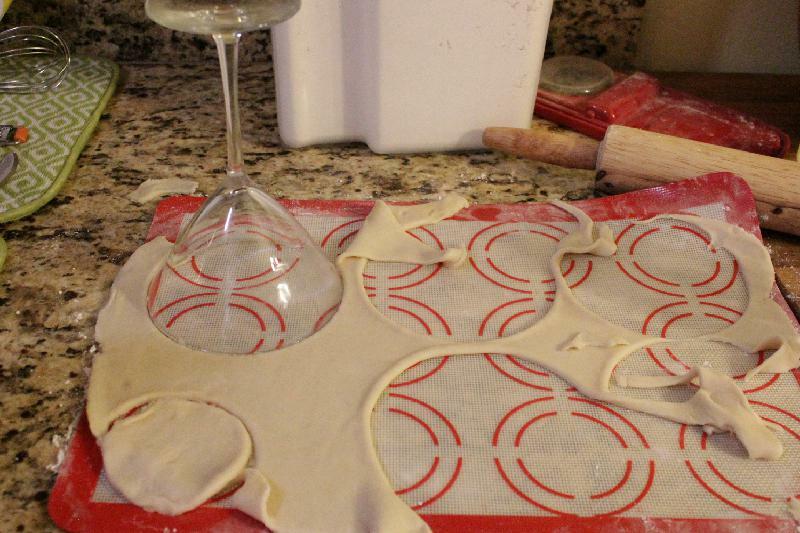 Use a smaller biscuit cutter or a large drinking glass to cut 12 smaller pie crust circles (heart cutouts optional). Pop the smaller circles in the fridge. Use one large circle to line each muffin cup, pushing firmly to remove air bubbles and to create nice high sides. Prick thoroughly with a fork, bake for 10 minutes, then remove from oven. Meanwhile, place berries and sugar in a saucepan over medium heat. Cook for about 10 minutes or until berries are soft. Remove from heat and mash berries with a potato masher or fork. Mix cornstarch with a few teaspoons of water or cooked berry liquid. Stir this mix into the berries, along with the lemon zest and salt. Fill muffin cups to the top with berries. Brush the rim of each cup with egg wash and add a top crust, doing your best to seal the top and bottom crusts together with fingers or the back of a spoon. If you didn’t cut shapes into the top crusts, use a sharp knife to cut a few slits in each one. Brush top crusts with egg wash and sprinkle with sugar. Bake for 25 minutes, or until crusts are golden but before the berry mix bubbles over. Remove from oven. While still slightly warm, go around the edges with a butter knife to make sure the pies aren’t sticking to the muffin tin. 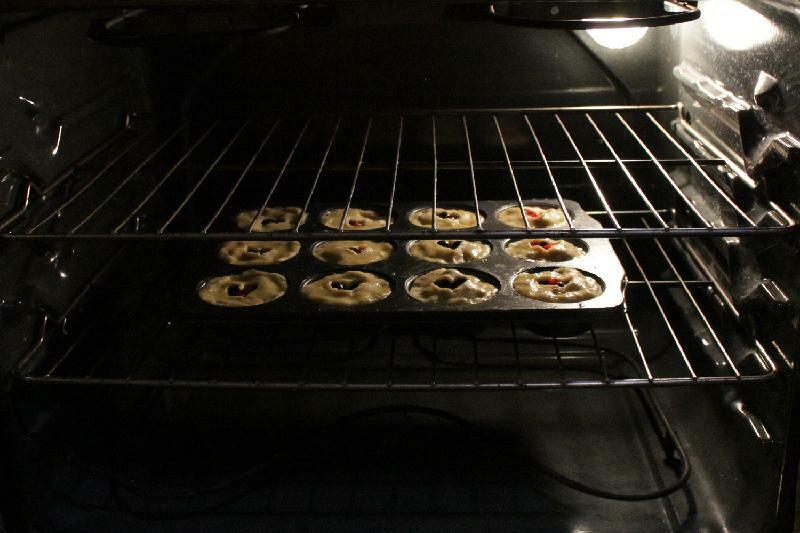 Then use a silicon spatula to gently lift mini pies to a wire rack. Gloat. How cute are these? I love how you topped them. Thank you! I can’t take credit for the hearts, though–my friend Kelsey cut them all out by hand! Awww – these are adorable! I love them! I am so impressed with these pies. You are right- I am daunted by making the crust. But if I bake, I would much rather know what ingredients are in the crust so not inclined to bake with store-bought. I hope to have the courage ( or rather the time…lots of time) in the future to attempt these beauties. Bummed to hear about the gestational diabetes. I understand the guidelines are stricter now than when I was pregnant. I’m sure I would have tested for G.D. at today’s standards. Praying the rest of your pregnancy will seem short because you will be happy and healthy and enjoying other good eats in the meantime. Thank you, Valerie! This last trimester is going quickly; hopefully the gestational diabetes will seem to go quickly as well. Your pies are adorable. Sorry about the pregnancy problems. You may have to change up your eating habits for a bit but it will be well worth the sacrifice when they put that little darling into your arms. I hope everything comes out fine. At least you only have 10 weeks left =/ Your mini pies are adorable. These pies look delicious! Don’t fret too much about the gestational diabetes. Hopefully it will be easily controlled and won’t mean anything too out of the ordinary. I had it too and though it did mean fewer slices of pie, Little Dude came out great! Beautiful! Sorry about your diagnosis, but you can manage…and it’s all worth it! Motherhood, while the toughest job I’ve ever had, is the more rewarding as well. Thank you, Camilla! I’m equal parts terrified and thrilled! hang in there…. I know its rough with the gest. diabetes… ❤️❤️❤️ I love the little heart cut outs in these…. they are simply adorable! Thank you! My friend Kelsey actually got out a paring knife and cut them out by hand! These minis are SO cute!!! So sorry about the glucose tolerance test—bad enough to have to take it, but then to have to change your diet makes it even worse. Thanks, Liz! Yeah, I’m not real thrilled about the diet change. Good thing it’s temporary! Sorry to hear about the blood test results, the things we do for kids! Hopefully it will pass before you are due, as I think it can, but either way it will pass and worth it. Glad you managed to make these cute little pies anyway too!